Here’s the important thing about John Wick: Chapter 2: it’s a grim, brutal, airless action film full of doggy reaction shots. The original 2014 John Wick was a surprise hit about an unstoppable assassin who’s dragged out of retirement for a few dozen more murders after a highly placed criminal thug kills his puppy. After killing generic villains by the busload in a stylish frenzy of mayhem, John Wick (Keanu Reeves) ends the movie by adopting a new dog to signal that he’s finally found some emotional closure. In the sequel, stuntman-turned-director Chad Stahelski and writer Derek Kolstad, reunited from the first film, just want to make sure the audience is clear on the message. John Wick still has the dog. The dog is fine this time around. A whole lot of fools who have not been sufficiently warned about John Wick are gonna confront him and end up with their brains spattering the walls, but the dog is gonna be okay. And the dog has opinions about all this brain-spattering, opinions that require a lot of reaction shots. The dog, incidentally, is pretty chill. It’s apparently okay with whatever John Wick wants to do. In that way, the dog is like the cat (played by Keanu) in the movie Keanu (inspired by John Wick). 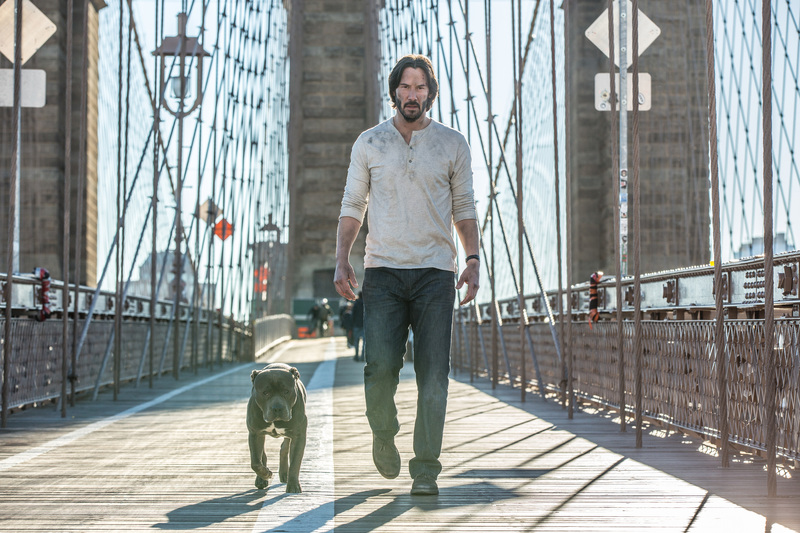 The filmmakers’ extensive concern for John Wick’s unnamed dog is a strange and frankly adorable form of squeamishness for a movie that features a man getting a pencil shoved through the back of his skull, a knife sliding into a woman’s body with pornographic deliberation, and a thug falling onto a glass floor and partially exploding in a lovingly rendered splatter of CGI blood. Conceptually, the first John Wick is a standard revenge drama, mostly exceptional because the raging protagonist is avenging a puppy instead of his family, and because every aspect of the filmmaking is as slick as the copious dollops of hair gel John Wick uses to slightly disguise his mullet. The dark cinematography, the screaming soundtrack, the bone-crunching fight choreography, and especially the secret underground assassin economy are all played for maximum cool-quotient impact, making John Wick the kind of film that picks up viewers on word of mouth, and creating the kind of world that viewers want to revisit as soon as possible. But the problem with a surprise hit is that it’s hard to follow up on the surprises that made it work in the first place. John Wick: Chapter 2 lets John retire from assassin life again, then drags him unwillingly back in, which means more kinetic, whirling fight scenes, more shudder-inducing improvised weapons, and especially more people getting shot in the face at point-blank range. But the first film’s best reveals are all related to that magnificently appointed secret assassins’ underground, full of luxury hotels where the guests are all murderers, the sommelier is an arms dealer, and every service is paid for in gold coins. Chapter 2 spends a fair bit of time in that world, but it has virtually nothing new to say about it. Nearly everything fans loved about the first film is intact again here, but the sense of discovery has been replaced by a scowling need to double down on the violence, the rage, and the stakes. By this point, though, the mythmaking around John Wick is wearing thin. Everyone in Assassin Land is aware he’s “the ghost,” “the boogeyman,” the unstoppable killing machine who chainsaws through henchmen like they were tissue paper. And yet people keep sending those henchmen after him, most noticeably in the kind of limp, predictable double cross that’s standard fare for most unstoppable-assassin movies, and that never, ever works out well for the double-crosser. No matter how inventive the fight choreography, or how unusual the pursuers, there comes a point where John Wick: Chapter 2 gets tedious, somewhere around the fourth time an entire mob of black-clad hirelings charge John and lose their faces, one by one. There are enough scheming supervillains in this movie to fill out the boardroom at an entire new Legion of Doom. And yet none of them have apparently ever heard of deathtraps, poisons, sedatives, or any weapon with a longer range than a machine gun. It isn’t their failure to actually kill John Wick that’s the problem, it’s their complete lack of invention or innovation in trying. And then there’s Wick himself. In the first film, it didn’t matter that Reeves has always been a charisma-void, growling, glowering statue of a man whose idea of emoting is lowering his head so he’s glaring up through his eyebrows instead of down his nose. But four hours into the franchise, his limits are getting frustrating. In scene after solemn scene, his co-stars bring all the emotion and complexity to the table. Doomed crime boss Gianna D’Antonio (Italian star Claudia Gerini) faces John with resigned, plaintive fury, and Common plays her bodyguard Cassian with so much brutal nuance, Stahelski should sign him on to take over the franchise. Watching them act out their regrets and their indomitability while Reeves glowers flatly in the background, it’s hard not to see John Wick as a sort of lethal Forrest Gump, stumbling straight-faced from one elaborate crisis to the next without ever changing expression or understanding the impact he’s having on the world around him. That said, fans of the first John Wick aren’t showing up to the second installment in hopes of seeing Reeves deliver Oscar-worthy speeches. They’re waiting to see whether the fights are breathless, the outfits are stylish, the cinematography brings the right blend of darkness and neon, and the occasional outright laugh line is funny. They are. They all have the dog-reaction-shot seal of quiet canine approval. John Wick: Chapter 2 is an enjoyable enough expansion on the first film. But its final-act setup for John Wick: Chapter 3 is more trying than promising. We’ve seen most of this film once before. Seeing it a third time doesn’t actually sound like much of a thrill, even to the most patient and obedient of dogs.